What made this attack unprecedented was that the terrorists struck the arrivals hall packed not only with passengers from recently arrived planes, but also with family, friends and contacts waiting to meet them. Terrorists love soft targets that help them in their purpose of killing and maiming as many innocent civilians as possible. For four decades airport procedures have tried, with increasing intensity, to stop would-be hijackers scoring the bull’s-eye of terrorist group publicity: bringing down a packed civilian airliner. This usually means security begins at the main entrance to the departures level and the check-in counters. Even so, there are many examples of terrorists launching attacks in the departure halls of airports. But arrivals halls have, by and large, been left open for arriving passengers to be met by friends, family and others. In many airports worldwide people off the street can even walk into the baggage claim area to mingle with arriving passengers. So Monday’s outrage in Moscow will doubtless lead to a review of public access to airport arrival halls. The attack at Domodedovo, which is about 42 kilometres southeast of Moscow and is a major hub for air transport within Russia catering to more than 20 million passengers a year, happened at about 4:30 in the afternoon, the busiest time of day. Police and airport officials say the blast or blasts took place in the least secure part of the airport where international passengers leave the baggage hall and walk through the arrivals area. Witnesses spoke of horrific scenes as the shrapnel with which the explosive vests were armed scythed through the crowd. The smoke and damage caused by the estimated seven kilograms of explosives made it impossible for survivors and emergency crews to fully judge the extent of the death and destruction for some time. The grim lottery of death cut some people to shreds while others standing close by were untouched save for the splattered gore of the dead and wounded. Russian President Dmitry Medvedev immediately ordered heightened security throughout the country and postponed his planned visit to this week’s meeting of the World Economic Forum at Davos, Switzerland. Russia, and particularly Moscow, are no strangers to terrorist attacks after two decades of often brutal suppression of separatist insurgencies in the southern border region of the North Caucasus. But this attack on a seemingly unforeseen soft target is a jolting wake-up call. Russia’s airport arrival halls are due to seethe with even more visitors than usual in the next few years. Russia will host the 2014 Winter Olympics at the Black Sea resort centre of Sochi and in 2018 the country will stage the World Cup of soccer. By late Monday no group had claimed responsibility for the Domodedovo attack. Attention, however, inevitably focused on the Caucasus guerrilla and terrorist groups, which have made several attacks on crowds in Moscow and other parts of Russia. In March last year two women from Dagestan in the Caucasus – one a widowed teenager – blew themselves up in a Moscow subway, killing more than 30 people. 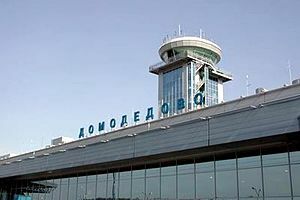 In 2004, Domodedovo Airport was again involved in a terrorist attack when two Chechen women boarded two planes. They exploded their vests in flight and killed all 90 people aboard the flights.